While of course no child should have to work, when kids want to sell water on a hot day or mow some lawns for cash, that's admirable. But some people will always try to ruin it. An enterprising 12-year-old boy started up his own lawn business, but had the police called on him by a client's neighbor. It was an outrageous story. In a heartwarming twist, things turned out okay — and business is booming. Maple Heights is a suburb of Cleveland, Ohio. It has a lot of homes with a lot of lawns and a lot of grass that needs to be trimmed. 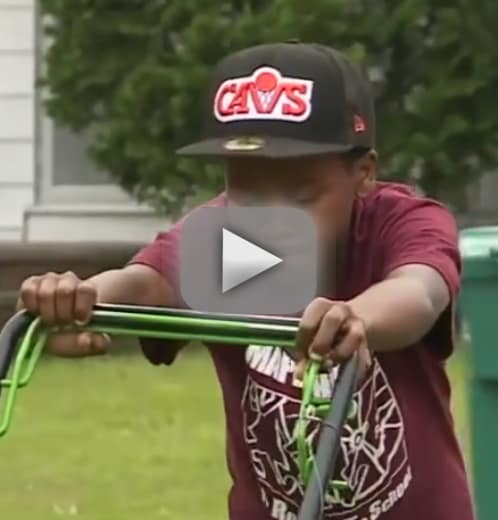 Reggie Fields is the enterprising 12-year-old boy runs Mr. Reggie's Lawn Cutting Service. That's not a joke — because this small landscaping crew is not a one-person operation. Fields runs the small company that also employs his cousins, who work starting as early as sunrise. They were mowing the lawn of a resident named Lucille Holt when one of her neighbors called the police. As Holt revealed in a video to Facebook that soon became widely circulated, her neighbors called the police because a narrow strip of grass that Fields mowed was technically in their yard and not in Holt's. Plenty of neighbors can be petty, or simply strict about defending which parts of a property belong to them. Most would simply come outside and tell the landscapers to avoid their part of the lawn — not call the police. It is strange for anyone to call the police on children — one of whom is as young as nine — for crossing an imaginary boundary while being helpful. "I'm so glad you're out here doing something positive," Holt said of the enterprising young people. "You should not be getting the police called on you because you're out here cutting grass. While everything turned out okay, it was not lost on Lucille Holt — or, really, on anyone reading the story — that calling the police on a young black child can have horrible, permanent consequences. We have all read too many heartbreaking horror stories of innocent, unarmed children dying because the wrong person was wearing a badge. Fortunately, this situation did not become a tragedy. In fact, the police officers who arrived were quick to realize that this had nothing to do with the hardworking children. And the police seemed intent on diffusing the situation of tension between neighbors before things escalate. Which is exactly what you want to see from law enforcement. It is, of course, the responsibility of the homeowner to inform their landscapers where the property boundaries are to avoid conflict. Reggie Fields was apologetic for the role that he inadvertently played in this squabble between neighbors. "They said I was cutting their grass. I didn't know it," Fields says. "I was like, that's a shame. I didn't know." Reggie's mother says that this story has been a massive boon for his business. "Some people are calling from out of town, saying, 'Can you come cut my grass?" she reports. It is no surprise that many people in the Cleveland area want to encourage these young entrepreneurs. Especially after someone chose to put them at potential risk. There are also businesses and other property owners interested in hiring his team. When a story goes viral like this, it creates an easy opportunity for good PR for local businesses. They look good, they help someone, and they get their grass trimmed. Reggie Fields' cash app is $ mrreggies18. His service line is 216-482-4308. Reggie will be entering the seventh grade, but he already has plans for how to continue his business in the fall — by purchasing more rakes so that they can pick up leaves. For the winter, he plans to purchase snow shovels. That's amazing. We hope that people exercise careful judgment when contacting emergency services. Jenelle Evans & David Eason: Finally SEPARATED?! Previous story Ryan Edwards: Stepping Away From Teen Mom OG to Focus on Sobriety?